Students can customize programs to match their interest and career goals. 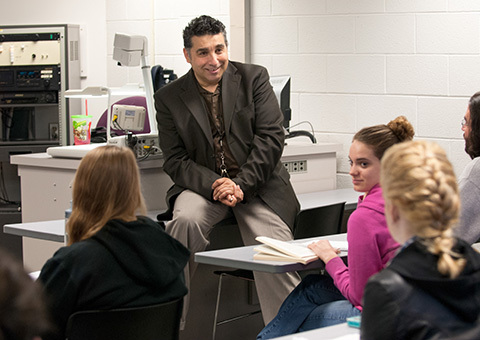 Each student has individual advising and access to mentoring from faculty and alumni. Students graduating with the modern languages major meet stringent oral and written proficiency requirements. Many modern language students study abroad, whether in an academic program, in the context of volunteering or mission. There are choices for summer, semester or year-long programs. For more information, see Study Away. The Language and Culture option prepares students with effective communication, critical thinking and problem solving skills. Fields such as publishing, public relations, communications, translation and tourism are possible choices. This option is also excellent preparation for graduate school. Students who choose to complement their language studies with a specific professional concentration enter the workforce with a unique combination of knowledge and skills. The need for employees with language expertise in business, media, criminal justice, technical communication and education continues to grow. As an interdisciplinary program, the Business concentration provides a well-rounded curriculum in business, language and culture. With a solid introduction to legal studies and criminal justice, students are poised to pursue careers in law enforcement or legal services. Students complete an internship that enables them to apply their language skills in the workplace in a meaningful way. This concentration area is for those with an interest in film, photography, broadcasting or print journalism. This program opens more international opportunities for students proficient in other languages. Students take courses in the Communication and Journalism Department, where they develop skills in media production and design, as well as complete an internship. Students learn how to communicate specialized information across technological platforms, such as online and social media. Students also learn how to write, design and edit different types of documents for the workplace as well as study user-centered design. NOTE: Students who are majoring in French will take the ACTFL Oral Proficiency Interview to receive official recognition for proficiency in French. NOTE: Students majoring in Spanish will take the ACTFL Oral Proficiency Interview to receive official recognition for proficiency in Spanish. At least 3 credit hours must be numbered 400-499. Are you ready to declare this major? Download, sign and submit the form to the English and Modern Languages Department. Mapping your degree plan is important. Consult with your academic advisor to create a plan and monitor it regularly.